Bayonetta Part #9 - Let's get ready to RUBBLE! Part 9: Let's get ready to RUBBLE! If humans were truly able to see angels, they would never expect an angel to appear as an automobile. However, it goes without saying that Irenic has existed long before even the concept of history. 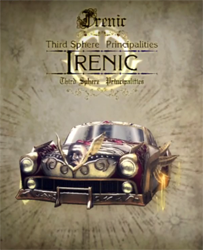 Irenic is charged with spreading the message of Divine Will across Paradiso, and is most commonly depicted as a boxy form with four wheels capable of achieving great speeds. Faster than even the wind, it can cross Paradiso, thousands of times larger than the human world, in nary a single day. Irenic is first known to have appeared before humanity in the mdid-18th century,coinciding with the start of the industrial revolution and the development of the first steam-powered automobiles. It can be said that Braves are capable of carrying God upon their shoulders. 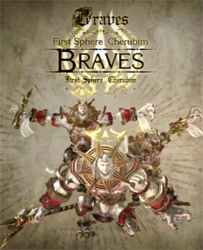 Moving in groups of three, each Brave wears the halo of the Second Sphere Powers upon its head; however, when necessary, Braves can combine three of their bodies into one true form, a First Sphere Cherubim. Boasting the most brute strength of all the inhabitants of Paradiso, an unknown number of evils have faced judgement at the hands of Braves.